chicken, beef, pork and more! KFC’s latest ploy for attention on Mother’s day is this: Chicken Flavoured chocolate. Only a few lucky customers of KFC New Zealand were able to snag boxes of the chocolate truffles for their mums, as with the boxes being auctioned off over facebook. 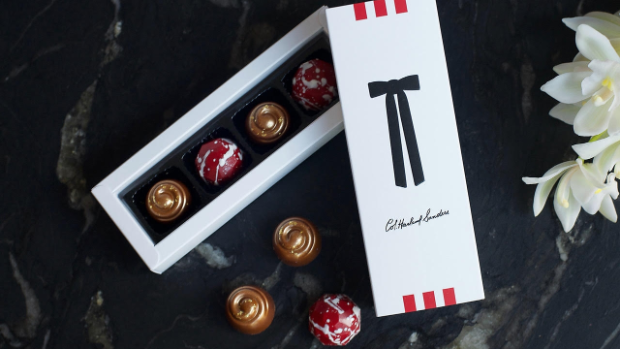 The chocolate truffles come in two flavours: a classic Colonel’s eleven secret herbs and spices version, and a hot and spicy truffle. Reviews are in and apparently the Colonel’s classic spices don’t do much to complement the flavour of chocolate, but the Hot and Spicy version is actually pretty tasty.